I told him both were the guy’s real last name. But, the names are not hyphenated, so do we have to use both of them during second attribution? I think so, I said. He’s Mexican. They use both last names. Yes, my editor said, but isn’t one of those names his mother’s last name? So, the first last name is his father’s name? So, that is his real last name? His real last name is both last names. Why don’t you have two last names? My family doesn’t use that anymore. This guy does, as do many Latin Americans. You know what we did? We chopped Mami’s name off on second attribution. So, if the guy’s name was Jose Perez Prado (’cause I can’t remember the real name), we used Perez the next time he was quoted in the story. And no doubt we did 100 different other versions in subsequent stories, and of course how we did it depended on whom was writing the story and whom was editing it. I have no idea what the policy is these days, as I have long since fled the newsroom. But, I bet plenty of the Latinos in town now know that the Americans don’t understand the two last names thing and they only give one during interviews. The book is written by an author of the same name, René Colato Laínez. Colato Laínez, a teacher, has written several picture books including the award-winning I Am René, the Boy / Soy René, el niño. The author has told other bloggers during his book tour that he writes to preserve and celebrate his culture. As a child he longed for books about children like him — immigrant children with two cultures. And these days it is common for Latino parents to thank him for writing their story too. His next book is The Tooth Fairy Meets El Raton Perez — American fairy meets her Latin American and Spanish counterpart, who happens to be a mouse. The release date is March. The author tells a hilarious and scary story about a child telling friends about the mouse who visits his house regularly and a teacher who believes the child is living in filth and needs to call social services. Hence, the idea for the book. Now, I loved reading the René book to Maria — and she enjoyed it — because my American child of Latino descent has two last names too. Yes, we gave our child four names. In between her Middle Name and Paternal Last Name is her Maternal Grandmother’s Last Name. We did it to honor my grandfather, whom I loved and adored, and the strong, courageous and crazy Cubans in her bloodline. Sometimes, I have wondered if we saddled her with too much nombre, but she says her name in a sing-song way and matter-of-factly to anyone who asks for her full name. She tells them that extra name comes from her mom’s abuelito.. And, I just stand there and grin. So, we have appreciated René and his two last names around here. He has given us the opportunity to discuss how people in different countries name their children, and he’s given us more time to talk about members of our family she never got to meet, hear a little more about where they came from — a place so different from the one she calls home. I can especially see how important this little book would be to children whose families have recently immigrated to the United States, and to the people they encounter at school, church and activities. As much as I’m glad to have the book on our shelf, gotta tell you, I’m thinking of dropping off my copy of the book at my old newsroom. Just in case they’re having the same discussion from the ’90s. 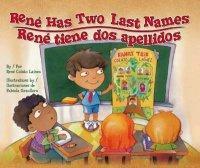 Leave a comment or question for the author and you will be eligible to win an autographed copy of RENÉ HAS TWO LAST NAMES/ RENÉ TIENE DOS APELLIDOS. Make sure you check back the following day to see if you won and for directions on how to receive your prize. The winner will be selected using Random.org. This review is part of a virtual book tour sponsored by BronzeWord, a great resource for Latino books and authors. This is a great article full of celebration for our familias and roots. Leave your comments and questions and you may get a signed copy of Rene Has Two Last Names. I just want to say “i love this book”. I was fortunate to receive a copy in one of the other blog tour stops (please don’t enter me in the drawing), our favorite part of the story is when René eats pupusas for dinner. My son loved that! Loved reading your thoughts on the book! Working in Education and teaching ESL for many years, I ran into that same question. Especially where I live now! I also gave them a similar answer to yours. But I also ran into the same problem, where- depending on whom registered the students is what their last name ended being for the rest or their US stay. Sometimes the mom’s, name other times the dad’s name, and rarely both. So when I worked for the intake center (where new students are registered into the country/county schools) I would proudly write down their full last name. Anyway, I have been planing on ordering this book and several others of his. So if I win, that sure would be a nice treat! I’d love to share this with my kids, who have two last names when they’re in their mother’s home country and one last name when they’re in their dad’s. I am very practical. As soon as I realized one last name is the way to go in the US I just named my children with one last name and I took off my 2nd last name. At the beginning I had people ask me what’s your last name and it was confusing when I gave 2 but little by little I got the point. My son doesn’t even have a middle name! …But that’s another story. The book looks great and even though my son doesn’t have 2 last names he’ll learn about our 2 last names in my family! John Lamb, Random.org likes You! E-mail me your address so the author and his people can mail you a copy of the book. Thanks everyone for sharing your story and hurrah, indeed, for more Latino options for our children. I would have loved to read about kids like me — bi-cultural children of immigrants — when I was growing up cubanita in Miami. I love that I read this post about this book today. My two-year old said her last name today for the first time, which is of course her father’s name (she even tried to roll her rr) and I was wondering how much time I should wait before introducing my last name (which is three words and quite a mouthful). I am hopeful that she will take pride in using both of her last names. Thank you, as always, for sharing such wonderful resources for parent trying to raise bilingual, bicultural children. What a great find. I’m going to purchase this book for my daughter. I too have two last names and when we immigrated to Texas from Mexico back in the ‘8os. the teachers thought one of the last names was my “middle” name and so I ended up with just one last name! I read about you in a form from CABE and asked my friend from work to go to your workshop and check your books. She did and brought me a flier with your information and about your new book. I am so very proud of you being compatriotas, not that many are authors specially kids books. I would love to get a copy of your new book and I don’t win it I will make sure I will buy it and read it to my five year old. Keep on writing and making our country proud.